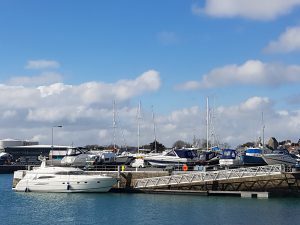 For larger volumes (minimum order 300 litres) of marine diesel (ULSD/AGO FAME free) Rubis Channel Islands service pleasure vessels at the St. Sampson’s, Guernsey Pontoon facility. This is now increased in length to accommodate larger vessels (see photo). Orders for fuel are by arrangement and customers can charge to their account or pay with credit/debit cards for the best fuel price on the day. Just call or if planning a few days in advance, email. 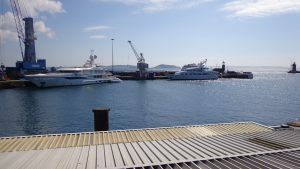 Rubis Channel Islands also fuel larger vessels direct from tankers on the commercial berths in St. Peter Port (see photo).